The transporters' strike had affected companies such as Ford and Mahindra with their passenger vehicles sales dropping. 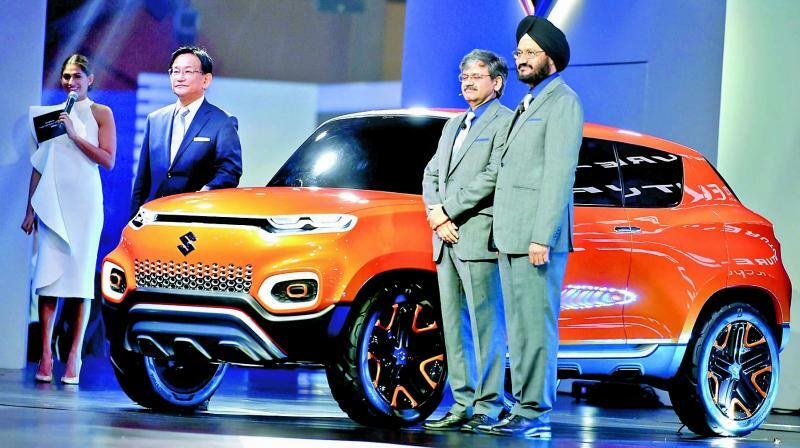 New Delhi: Leading automakers Maruti Suzuki India (MSI) and Hyundai Motor on Wednesday posted marginal growth in domestic sales for July on account of high base in July last year. The transporters' strike in July had affected companies such as Ford and Mahindra & Mahindra with their passenger vehicles sales dropping, although Honda Cars reported its best ever July sales riding on the success of its new Amaze. Toyota Kirloskar Motor (TKM) saw its July sales falling due to high base in July last year. MSI said its domestic sales were up marginally at 1,54,150 units last month as against 1,54,001 units in the year ago month. The company witnessed robust growth in compact segment which includes models like Swift and Baleno but saw a dip in sales of mini segment cars and utility vehicles during the month. Sales of mini cars comprising Alto and WagonR were at 37,710 units as compared to 42,310 units in July last year, down 10.9 per cent. However, sales of compact segment, including models such as Swift, Celerio, Ignis, Baleno and Dzire, were up 17.8 per cent at 74,373 units as against 63,116 units in July last year. Utility vehicles, including Vitara Brezza, S-Cross and Ertiga were down 4.9 per cent at 24,505 units as compared to 25,781 units in the year-ago month. "While the growth rate may look flat, one must look at the absolute volumes in July, which are very robust even by our own high standard," MSI Senior Executive Director (Marketing and Sales) R S Kalsi told PTI. He further said the flat growth seen in July was primarily due to high base in the same month last year. "In June this year we sold around 1.34 lakh vehicles (less than July) but the growth rate was 44.5 per cent," he said, adding if the June-July period was taken together the company's growth would be 17 per cent over the year-ago period. Rival Hyundai posted 1.1 per cent increase in its domestic sales last month at 43,481 units as compared with 43,007 units in July 2017. Honda Cars on the other hand posted 17 per cent increase in its domestic sales to 19,970 units in July, riding on new Amaze which sold 10,180 units setting a new record for the highest ever monthly sales for a single model in the company's history. "We have recorded our best ever July sales, thanks to the overwhelming response to the all new Amaze and sustained momentum for City and WR-V," HCIL Senior Vice President and Director, Sales and Marketing Rajesh Goel said. On the other hand M&M reported a 6 per cent dip in sales of its passenger vehicles, including Scorpio, XUV500 and Bolero, at 19,781 units compared with 21,034 units in July 2017. "The auto industry has been subject to certain uncertainties with the truckers strike and sluggishness on the retail front which has impacted the passenger vehicle segment," M&M President Automotive Sector Rajan Wadhera said. Toyota Kirloskar Motor (TKM) reported 22.94 per cent dip in domestic sales at 13,677 units in July. "June-July 2017 was a unique case owing to last year's GST scenario, wherein the company supplied as per the market demand which was impacted due to impending GST implementation," TKM Deputy Managing Director N Raja said. Similarly, Ford India saw its domestic sales dipping by 7.15 per cent at 7,816 units last month as against 8,418 units in July 2017. "The transport strike impacted both the production as well as shipment of Ford vehicles in July," Ford India President and MD Anurag Mehrotra said. In the two wheeler segment, Bajaj Auto reported 27 per cent increase in domestic sales units last month at 2,37,511 units. TVS Motor Company said its domestic two-wheeler sales increased by 13 per cent to 2,47,382 units in July as against 2,19,396 units in the year-ago month. Niche bike maker Royal Enfield reported 6 per cent increase in domestic sales at 67,001 units last month as compared with 63,157 units in the same period of last year.